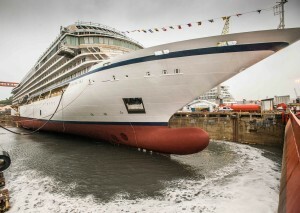 Viking Ocean Cruises’ third ship – the 930-passenger Viking Sky – was “floated out” last week, marking a major construction milestone and the first time that the new ship touched water. The traditional ceremony took place at Fincantieri’s Ancona shipyard, just one day before the company took delivery of its second ship, Viking Sea, which will officially debut to guests next month. Viking Sky is scheduled for delivery in early 2017. The company also today announced that it has placed an order with Fincantieri for three additional sister ships, which will bring Viking’s total number of ocean ships to six by 2020.